This week’s Fitness Friday is a little more personal. 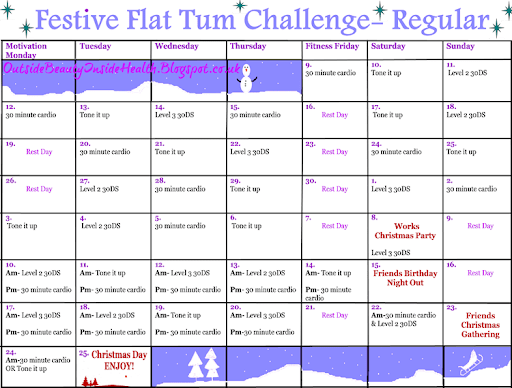 I am setting myself a challenge of getting a festive flat tum! We have 6 weeks and 4 days until Christmas, or 46 days, really not long! However it is long enough to do something about your body if you want to! I know this time of year is busy and stressful, with parties to organise and attend, deadlines at work and university and Christmas shopping to be done, but if you can spare half an hour to an hour a day and make small changes to your diet you will notice a difference in your waistline, and will look amazing in your Christmas party dress… just imagine the dress! By starting now, and by pushing yourself you will look and feel amazing, but more importantly will be the most confident you! I personally can’t wait to look drop dead gorgeous in my Christmas party dress, and turn some heads this year. Over the next 46 days I am challenging myself and you to become toned, motivated and confident. I am aiming to tone up my hips, bum and tum (hence the title) and am going to share with you how I plan on achieving this as well as keep you updated with on-going posts about all my highs and lows, meal ideas and workout reviews. Eat clean(er)- Swap my snacks of crisps and cereal bars for fruit and nuts. If it comes from a packet it’s not going near my mouth. Reduce the carbs and up the protein- My dinner is always low carb, however I eat carbs for breakfast and aim to swap this for a more protein full breakfast, by replacing my cereal bars for egg; boiled or scrambled. Keep the alcohol to a minimum! I am doing pretty well at this since I have moved home, but still need to keep control of it at the weekends… no bottle of wines in front of the television on a Friday night. Breakfast- Yoghurt and fruit with scrambled egg, bacon & tomato/ boiled egg. Lunch- Soap (homemade ideally) or vegetable crudités with houmous. This is where I am going to excel! Go hard or go home as they say! I already try to run at least 2 miles a day, 5 times a week, which has significantly helped my waist line over the past couple of months. I aim to continue this and also add another workout, so I will be working out twice a day, one workout will be cardio based, the other will be strength and toning. The running will make up my 30 minutes of cardio but you can choose a different cardio exercise if running is not your thing. You could try swimming, skipping, aerobics, Zumba, cycling or even a brisk walk. For my second exercise I plan on concentrating on toning by using a variety of workout videos. I am going to use the 30 Day shred workout, varying between levels 2 and 3 as they both use different muscles, as well as using the workout videos form the lovely Tone It Up girls, who have a Holiday Hotties workout challenge going for themselves at the moment. These workouts tend to last around 30 minutes, so I won’t be over doing it as I will only be working out for around 1 hour a day. I have included two workout calendars, one the “Go hard or Go Home” option which I will be using, and another less strenuous plan for those just starting to workout or who don’t workout often. Yes they are both a challenge, but that is the fun of it! With your health and fitness you get back what you put in! If you workout hard and often then your body will soon see results, and you will look fab for Christmas. I have designed the calendars to match my schedule and Christmas plans, but feel free to change them. Also one last tip; please make sure to stretch well after all your workouts! I will be posting regularly throughout this challenge, with updates on my Twitter and two blog posts a week. One will be Motivation Mondays, which will include a load of motivational pictures and sayings to keep you on track, the second will be a Fitness Friday, which will share my highs and lows, along with healthy meal ideas and workout video reviews. Be sure to follow me on Twitter so you can keep up to date with the latest posts and I can spur you on with your own fitness kick. Let me know if you do want to join me, I need all the support I can get! 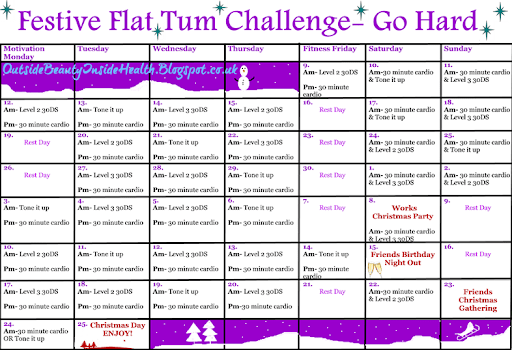 Do you have your own personal plans to get fit this Christmas? Are you aiming to fit into the perfect party dress like I am? aire bra said…..Dear admin i am too much satisfied from your post. I hope you will countinue your good work, i have no words which i say you, May God bless you and you will keep continue it….. I too decided I'm not going to let the holidays add any bulk. While everyone else is indulging I want to prove that you CAN lose weight and look better even during the holidays. And, it will definitely help get a leg up on the summer bikini season. My plan is very similar, except I will be doing 30min cardio a day + weight training (varying between lower and upper body days) along with 2 days doing HIIT and abs. Twice a days is a good idea though, may have to up my game 😉 Good luck!! aire brasaid that this good blog for ever and nice postingGood work its really like it..